Description of adults: Examined: Original description by Heath (1986). Forewing length: 2.7 - 3.4 mm, 3.0 - 3.7 mm. "Head pale golden, antenna golden fuscous.Thorax golden, tegulae golden. Forewing dark golden without markings; cilia golden. Hindwing bronzy golden. Abdomen golden." Following Heath (1986), the species is only known from Algeria, where it has been found near Constantine and Phlippeville (= Skikda). 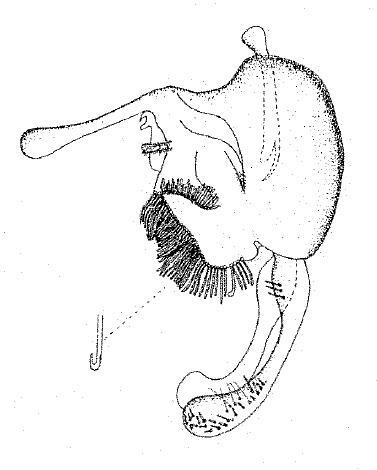 Nothing is known about the biology of M. constantinella. Genitalia. "Uncus long and slender, club-shaped; accessory clasper with a continuous row of very long, hooked setae on distal edge and a similar row of setae on an inner ridge. Clasper spatulate with long rows of moderately short, stout setae on inner surface of distal end and three long, postbasal setae on inner surface." (Heath 1986).